Jay Cutler told reporters it could be anywhere from 3 weeks to 10 weeks until he's out on the field playing again. Jay Cutler described the three screws and two pins that are holding together his thumb at a press conference Wednesday. The Bears quarterback considered his treatment carefully. 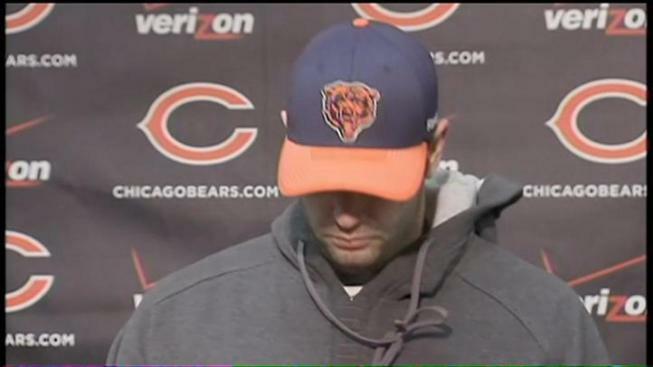 "They told me it was serious," Cutler said, recalling the break. "I didn't imagine I'd have to have surgery." A "Bennett's fracture" -- as it's called -- occurs where the thumb meets the wrist. The on-again, off-again relationship between Chicago Bears quarterback Jay Cutler and reality TV star Kristin Cavallari is not only back on again, but the two are engaged ... again. "It was uncomfortable but I was able to get through. Playing the whole game would've been a problem." Cutler received word after the Chargers game that he'd need the surgery on his throwing hand. And when a quarterback is told he needs surgery on his throwing hand, he takes his future into his own hands. Cutler bypassed Bears team doctors and found a hand specialist on his own. He chose Dr. Randy Viola of the Steadman Clinic in Vail Colorado. According to Becker's Orthopedic & Spine Review, Dr. Viola is ranked in the top 50 hand surgeons in the country. "We talked to a lot of Doctors around the country and I wanted to go to somebody I felt comfortable with and has a really good track record." Dr. Viola is a Bloomington, Indiana native. Cutler, who's from Santa Claus, Indiana, said he only knew of the doctor's reputation. Rated in the top 50 of hand, wrist & elbow surgeons according to Becker's Orthopedic Spine Review, Dr. Randy Viola works with the U.S. Ski team and Denver's pro sports teams. Athletes like Ray Lewis of the Baltimore Ravens, the Yankees Alex Rodriquez and tennis star Monica Seles have all been treated at his Steadman Clinic in Vail. According to the VailDaily.com, the Steadman clinic has a reputation for thinking outside the box and thus can give athletes shorter recovery times. Cutler would only say his time frame to return was 3-10 weeks. Cutler is scheduled to have some XRays and CT Scans next week to check on how well the bone is healing, the pins will come out, but the screws will stay in. Cutler said the pins could be removed anytime after three weeks, or it could take up to 10 weeks. He told reporters there are many factors contributing to when he will be back to play and he's taking it week by week. "It's just a matter of that bone really healing and me feeling comfortable with it," said Cutler. The doctor was careful in where he placed the pins and screws to make sure Cutler wouldn't have many complications when throwing the football, but Cutler said he will lose a little flexibility in his thumb. In the next few weeks, doctors will take X-rays and CT scans on his thumb to see how the bone is healing. Though he wishes he could play in Sunday's game, Cutler said he knows he has to be smart about it and "realize there is a long term picture here." In the mean time, Cutler is not enjoying his new role sitting on the sidelines and wants to be back playing on the field as soon as he can. "I don't like watching practice. I don't like any of this. This is not what I signed up for. This is not anything I've really been a part of. So it's definitely hard on me. The sooner I can get back out there the better." In the meantime, its all rehab, and oh yes Cutler confirmed a wedding to plan. 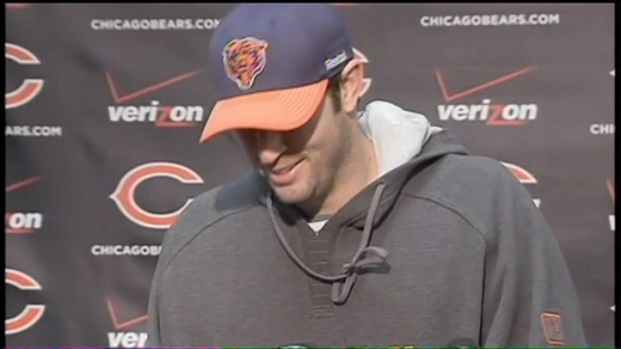 "I just heard about that" Cutler laughed, "I'm joking don't write that, I'll get in trouble." No date for his return, Cutler confirmed, and no date for his "on again" wedding to reality tv star Kristen Cavalarri.